Who is tuning into this? I've watched this race for the last 3 years. The track (Guia Circuit) is absolutely amazing. Scary accident. She flew through that fence like it wasn't there. Still no offical health update. Hoping she's ok..
Was watching it live when it happened. I thought I caught a glimpse on the live feed of something going on in the background. Thankfully it sounds like everyone is alive and not too bad off. 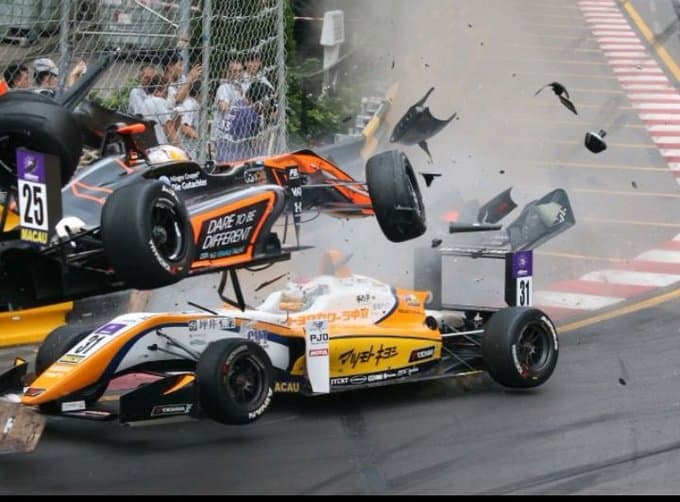 Macau Grand Prix organisers have confirmed that Sophia Floersch is conscious and has been transferred to hospital following a terrifying accident that stopped the race. The German was launched into the air and over the crash barriers after striking the TOM’s car of Sho Tsuboi at Lisboa Bend, having lost her wheels in a crash further up the long straight before the tight right hander. Floersch’s car went through debris fencing and struck a photographer’s bunker before landing back on its wheels. A statement from the organisers said that both Floersch and Tsuboi were concious and had been taken to hospital. Three further individuals, two photographers and one marshal, were also involved in the accident, with them also being transferred to hospital. The race was restarted following a delay of more than one hour to attend to the individuals involved in the accident as well as repair the fencing. Horrendous crash - motorsport and BBC reporting a fractured back. Injuries to the marshals and photographers include - facial fractures, concussion, and liver lacerations. But it fortunately sounds like nothing life altering. I do wonder if Macau is fit for purpose - the number of incidents every year. There are so horrendous slo-mo videos on YT that I won't post but people were very seriously injured in this accident. The driver, has a fractured spine and one track marshal was hit by one of the fence uprights in all 5 taken to hospital. There's no footage of what caused the accident up the road, some are saying brake failure or a tap with another car. In the motorsport article one of the drivers said a local yellow - possibly false from the trackside lighting. Ferrari junior Guan Yu Zhou, who was following Floersch at the time of the accident, explained that it was due to yellow caution lights flashing on the straight. “First of all it was such a scary moment,” said the Prema Powerteam driver, who was making his way through the pack after a crash in the qualification race and an engine change relegated him to 28th and last on the grid. “Coming after Mandarin [the preceding right-hand kink], I saw the yellow, but I think it was just a mistake by the organisers’ station. “Sophia was really close to Jehan, so when Jehan braked early she had no time to react. “She hit Jehan’s right-rear, and that spun her around straight into Lisboa, and she flew into the other car. The way information has come out is normally an indication of the severity of the injuries. With Wickens the information was that the spinal injury was serious but there was nothing more for weeks - in this case they are reporting she was talking to paramedics about back pain then immediately the press release says that it's a fracture. Likewise the marshals and photographers they are reporting the injuries. Not that it's not serious, but it sounds like a more positive outcome than other incidents. Not that it's not serious, but it sounds like a more positive outcome than other incidents. Sophia was lucky that her head appear to pass through the gap in camera platform but even so that was a significant acceleration to the body. I think it's positive no one lost their life but a 17 year old with a spine fracture is far from good. Apparently she is having surgery tomorrow and I hope she has the best possible outcome. I knew that no one had died when I watched the footage but had I not I wouldn't have given them much hope. I can't recall a bigger impact. That's a nasty one! looks like she got hit on top of her head by some armco. That was a horrific crash. The speed of the impact was insane. If she really is "fine" as she apparently reported herself using social media she is the luckiest person alive. I hope that everyone involved will fully recover. I also think that what saved her was the fact, that her head did not hit the photoreporters bunker directly but just passed through the opening. Nevertheless, the deceleration must have been huge and the direction of the impact was surely not the one that the manufacturer or FIA based the design on. Edit: the driver whose car she hit before going airborne was also lucky to escape serious injuries. Yes very nasty. Lucky she hit backwards or it could have been even worse. Sounds like she is in good spirits. Probably thankful to just be alive. Once again shows how safe todays cars are. the sheer velocity on which the car plowed through and hit the fence is mind-boggling scary. is also just really scary and unacceptable. and C) these 'feeder formula' have gotten so fast that safety standards aren't covering it anymore. hope everybody comes out of this fully recovered, but this is just madness. the story of 'accidental' yellow doesn't add up to me. it may have happened, but if you compare the speed of the rest of the cars, and then see her speed, then she was just way too fast. as if everybody came through a chicane and she just came flying in from a total straight full on. btw, getting more and more annoyed with how people just keep flipping out their phones and grab this stuff. Dumpster sounds so much more classy. It's the diamond of the cesspools. She lost 2 wheels and was skidding along on the floor with very little retardation. Floersch's team are saying if she had hit the 'safety' barrier things would've been far worse, quite a staggering admission that Macau is an unsafe circuit as many have said over the years. In what world can it be safer for everyone if the car is catapulted over the safety barrier into a camera tower? Did you see the camera man who very likely took the picture of the flying car immediately lean out of the camera tower and start taking photos of the stricken driver in the car, he was thinking money, so you can't be too hard on spectators for rubber necking with their phones. Isn't that why the difference in velocity was so high?? The car ahead braked early for this phantom yellow and she didn't - can't slow the car when it's flying backwards through the air. It's not her reporting that from the racing driver excuse handbook - it was another competitor. I think it's positive no one lost their life but a 17 year old with a spine fracture is far from good. Apparently she is having surgery tomorrow and I hope she has the best possible outcome. Such an incident is never good no matter what age. However, at that age you still have more vitality to have a higher chance to recover fully from it. Surgery is taking quite long; I guess she is still ok, but that the operation is just very delicate. In 2020 (or if they move ahead possibly next year), the engines will make a jump from 200bhp to 275-300bhp. If this circuit is posing these kind of dangers now already, then it will be even worse when they get more power, more weight and more speed. The incident has already been judged by the stewards I believe, and they decided nobody was to blame predominantly.